4 p. : ; 24 cm. "Approved Code No. 197--Amendment No. 2." Charleston, S. C.: Chamber of Commerce Building. Louisville, Kv. : 408 Federal Building. Battle, Wash.: 809 Federal Office Building. an approval of said Code in its entirety as amended. accordance with the provisions of the Code. tunity to be heard has been accorded all interested parties. section (b) of Section 10 thereof. 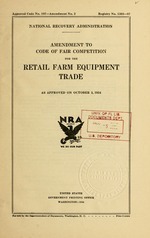 said amendment on behalf of the Trade as a whole. For these reasons we have approved this amendment. By G. A. LYNCH, Admin ifsrative Oficer. Approved Code No. 197-Amendment No. 2.